Musician, songwriter, visual artist, thinker, teacher, spiritual healer…. As a lyricist Kate dreams of matching stories and ideas with their perfect expression in words. As a composer she listens to the ideas until they express themselves in a natural melody. As a harpist she evokes the instrument’s voice, engaging the ideas or stories through her hands, and as a singer she strives to engage and delight her audience through her heartfelt message and performance. Kate continues to craft beautiful inspirational songs which she began in while studying with Peter Link at the Watchfire Learning Lab. Kate attended Saturday morning Orff method music lessons as a child. These wonderful classes taught her what music IS and how to engage it. Upon graduation her teacher told her parents “Now Katy is ready to learn an instrument” She then went on to learn to play the recorder and the viola. It goes without saying that singing and living are one and the same for Kate. As an adult, Kate obtained a Bachelor of Fine Art (1981) and a Bachelor of Education (1984) from Queen’s University. Kate also studied voice, taught recorder, and sang in premier chamber ensembles in Ontario and BC while raising her family and teaching music and children’s art classes. 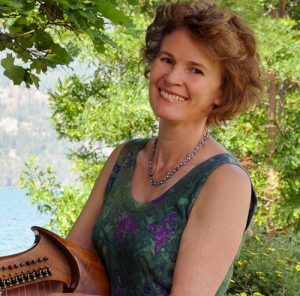 In 1997 after moving to the Okanagan Valley in British Columbia, Kate fell in love with the Celtic harp and has been playing, teaching, song writing, recording, accepting commissions, and performing in Celtic bands, festivals, churches, ensembles and solo, with it ever since. Since 2000 Kate has been a member of the acclaimed harp/vocal trio AnamCara enchanting audiences throughout Western Canada with original music, dynamic arrangements, Celtic harps and delicious vocal harmonies. 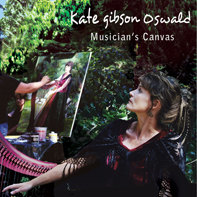 Kate’s solo CD Musician’s Canvas (2004) is a delightful compilation of traditional music, original songs, instrumentals, and inspired nature poetry set to music. In 2011 Kate spent almost three weeks in New York City honing her song writing and performance skills with Peter Link of Watchfire Music. In addition to her work as a musician and teacher, Kate is also establishing a Christian Science healing practice and begun facilitating inspirational workshops that include inspirational music. "The CD is marvelous – a work of art. It speaks of love for family and the world around us with a strong and sweet voice."